These high liquid alt-coins- Lumens, NEO, LTC, Monero, IOTA and LTC continue to edge higher. As per our expectation and as history shows, often strong surges are followed by periods of lower lows or consolidation before trend resumes. That’s what we saw yesterday and it is for this reason that we should wait for better entries before trading. Most cryptocurrencies got a short in the arm after March 18 G20 revelation that cryptocurrencies don’t actually pose a threat to the establishment. Going by that, all high liquid coins are edging higher with Lumens gaining 24.74% according to data from CoinMarketCap. 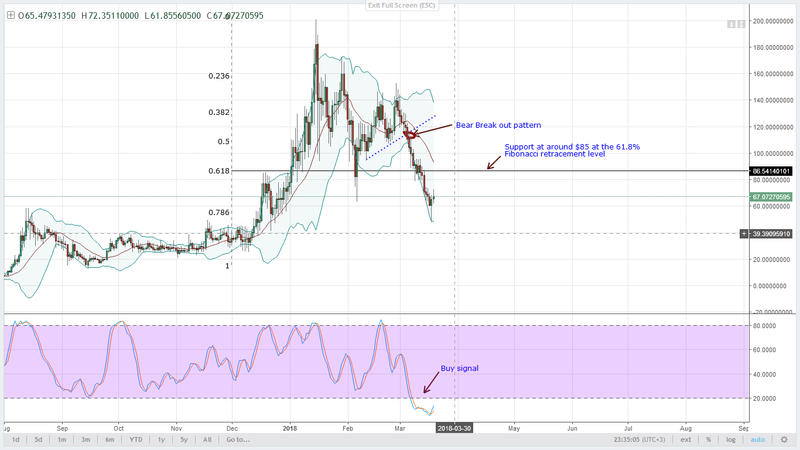 It is a relief for buyers after Lumens recent slump before finding support yesterday and today, I expect prices to build up on March 18 impressive gains to complete a 3-bar reversal pattern in the daily chart. 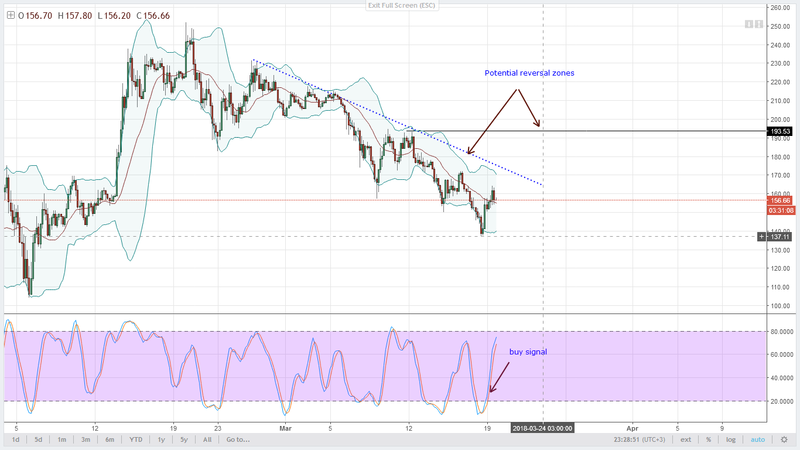 After all, there is a stochastic buy signal and since March 19 is positive, buyers can look for entries in the 4HR chart where they can buy on pullbacks towards the 20-period MA. 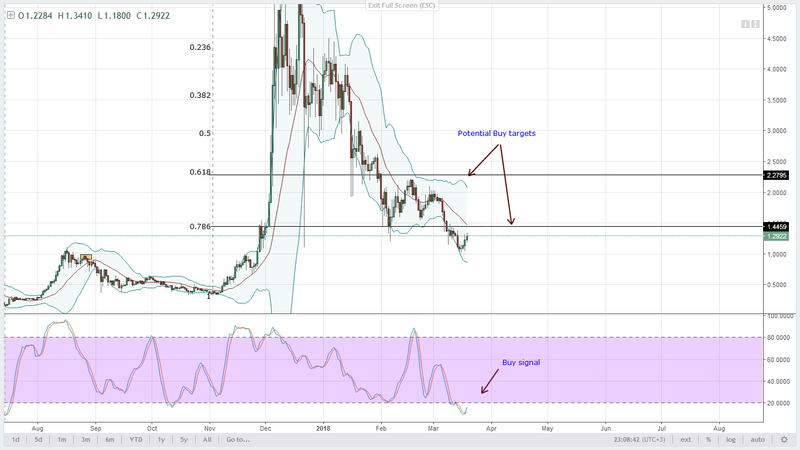 Even before yesterday’s higher highs, IOTA was-and is still bullish. For better reference, you can check out the daily chart and price action between March 15 and 17. There you can see that a 3-bar reversal pattern was panning out and with the bullish follow through, prices might actually get past $1.45 the middle BB or the 78.6% Fibonacci retracement line. 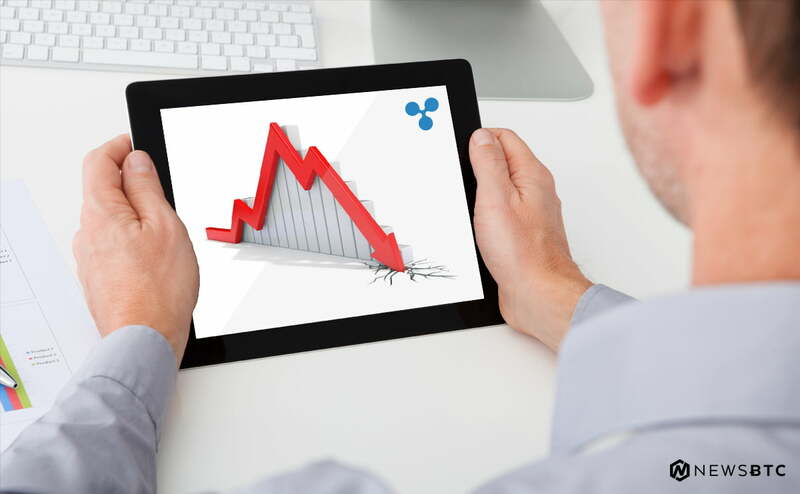 Now that there is change in sentiment and a stochastic buy signal turning from deep the oversold territory, we can as well pick buy opportunities in lower time frames and aim for $1.45 in the short term. If there is a bullish break out and a fade of the recent bullish break out then $2.2 or the 61.8% Fibonacci retracement level is the next bull target. After March 19, we are now seeing a nice and classic morning star pattern. 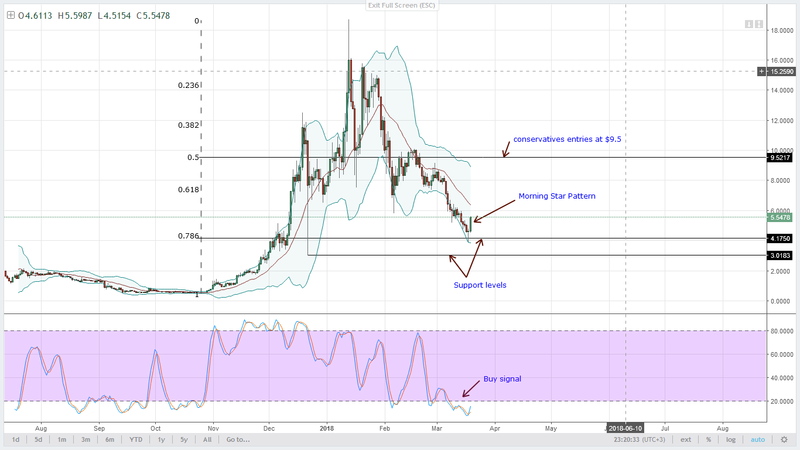 Besides, there is a buy signal forming right within our previous support zones between December 22 lows of $3 and the Fibonacci retracement level at $4.2. It is from this technical development that there is a high chance that buyers might push higher and close above the middle BB at around $7. Remember from our analysis, the middle BB continues to be our immediate resistance line. As such, EOS supporters should fine tune long entries in lower time frames-read 1HR or 4HR chart and aim for $7 and $9.5 in the short term especially if there is a bullish break out above the 20 period MA. 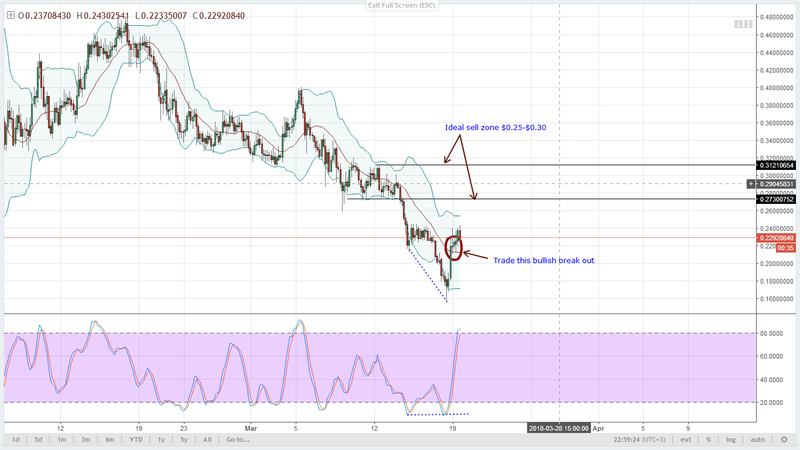 Price action hints of possible gains of LTC even though buyers are only $7 up after yesterday’s G20 news. In my view, our forecast is still the same and buyers should be looking for long entries in lower time frames. Conservatives can wait for a breach of the resistance trend line visible in the 4HR chart and go long on pull backs. By my own projection, those entries should be between $170 and $150 assuming LTC edge higher in the next few days. Before then though, patience before committing should be an asset. The last time NEO prices were trending above the middle BB was in late February. Since then the liquidation of the middle BB has been visible and its only yesterday did prices edge past this level. Because of that, we can be comfortable with trading a bullish break out pattern happening at key support line at $55. That’s the 78.6% Fibonacci retracement level and spiced up by a stochastic buy signal. Note this though. Even if we can rave about bullish potentials, let’s not enter blindly. Enter at every stochastic buy in the 1HR or 4HR chart assuming you didn’t get in yesterday.